January 17 this year is the fourth anniversary of Zhao Ziyang's passing. Ding Zilin, the founder of Tiananmen Mothers visited Zhao Ziyang's former home by herself and wrote about the experience. 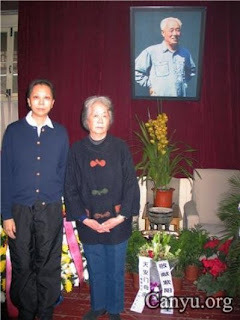 Every year since Zhao Ziyang's passing, Tiananmen Mothers have organized group visits to his home, where a permanent memorial resides. Due to heavy police interference and harrassment, they decided to do it separately this year. Ding Zilin brought six red roses and four white roses, a symbol for Tiananmen Mothers, along with four white lilies for the anniversary. She was followed all the way but was allowed to enter the memorial and chat with Zhao Ziyang's relatives. Her flowers bore the signature of "Tiananmen Mothers" and was placed at the center of the memorial. Signing in the visitor's log, Ding Zilin wrote, "Mr. Ziyang, you have left us four years, but you are still with us, for the same demands, the same destiny."